Create a charming avian neighborhood in your garden using the Home Bazaar White Novelty Cottage Bird House. Evoking seaside homes along the New England coast, this classic roost will certainly welcome any bird family. The pitched, pine shingled roof features a faux dormer, and protects the 1.25" diameter entry hole on one side. A closed circle on the other side brings symmetry to the piece. The picket-style railing on the top and base of the item create the illusion of a dual level, offering birds a deep roost for safety. Vivid white paint througout the piece creates a fresh look, completed with the natural hue of the pine shingles. A flat panel on the back of the home removes easily for nest checks, while drainage holes on the base help the nest remain dry. A piece of screening beneath the entry hole acts as a ladder, assisting fledglings in reaching the exit. Use the attached hanging tab to place this home on a post, fence, wall, or other vertical surface, or rest its flat base on a post (not included). The hardwood body will withstand use for several seasons, while the white color remains timeless. 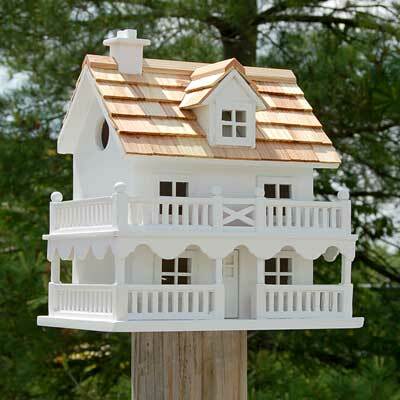 Bring working architecture into your bird sanctuary with this White Novelty Cottage Bird House.